Ramona's Voices: Forcing Religion in Public Schools is not Frowned on in Mississippi. I'm Shocked. Now, it isn't so much that someone in a public taxpayer-funded secular school came up with the idea--off-the-wall ideas are everywhere. It's that so many others thought the idea was a good one. They thought it was such a good idea, in fact, that part of the plan was to station teachers and parents at the doors so that no kid could escape leave. When some of the students tried to leave, according to the complaint, Officer White, the truancy officer, "harassed them and told them to sit down". When some of them tried to go from their classrooms to the library instead, Officer White was on it. They were herded to the assembly. The complaint says that over the three assemblies there were anywhere from 20 to 30 staff members in attendance, along with anywhere from five to 10 of the student church representatives' parents. So, in essence, (no, in fact) the kids in that public school were forced to listen to the preaching of a particular brand of a particular religion, and--get this--nobody in charge thought there was anything wrong with that. It wasn't a one-time fluke of a thing. As noted, it happened at least three times, starting on April 9. At least three times preachers were invited into a public school assembly and at least three times the students at Northwest Rankin were pulled out of their classes and required to attend. Finally, one of the kids taped a portion of the assembly and it found its way to the American Humanist Association. Now it's a First Amendment issue, along with another chance at embarrassing a heretofore oblivious sorry mess of an American state--futile as that might be. Some of us will be shaking our heads over this, tsk tsking all over the place, but who wants to bet nothing much will happen here? At most, they'll have to agree to stop holding Christian assemblies and that will give them a chance to scream about freedom of religion. 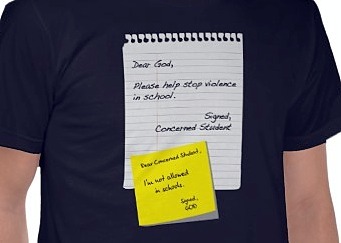 We'll be seeing those posters and tee shirts where God is sad about not being allowed in schools, and anybody who sees what happened at Northwest Rankin High School as a bad thing will be reminded that the lesson is an innocent one about Jesus' love so who but a liberal commie atheist would complain about that? Well, I would. And I did. And I will. Because it isn't about God, it's about religion. And because forcing any religion in public schools is frowned on in a country where freedoms are supposed to be cherished. All across this free country laws upholding fundamentalist Christian values are being written in states where those groups have gained a foothold. They're re-interpreting the constitution to read that while no national religion can be established, it's perfectly okay for states to have some wiggle room regarding somebody's idea of faith-based values. Apparently there's nothing mandatory about elected or even school officials being made to understand the reasons why certain clauses in our particular constitution came to be. We should probably work on fixing that. What would stop this is if the local citizens would be able to sue the people who made this decision personally. It's easier to make these types of decisions when you know that someone else is footing the legal bills. Stupid is as stupid does and this is pure stupid. Isn't there anyone in that town aware enough to know the courts have already ruled against this kind of thing?? It'll be interesting to see where this goes. I'll try to do a follow-up soon. I'm a card carrying minister but I don't preach and I'm not a christian, or a muslim, I have performed a number of marriages and a death service.